Every man who runs a traction engine ought to know something of the magnitude of the force he is working with. He ought to know something about the strength of the materials in his boiler and engine. He ought to know the exact construction of every part of his machine. He ought to know how to make all necessary repairs and make all necessary adjustments, and he ought to be familiar with the scientific laws governing every operation of an engine or any of its parts. So far as possible without taking up mathematical theory further than can be done with simple arithmetic, the following lessons will present the subject in accordance with the general outline laid down above. When the writer was asked seven years ago to prepare a course of lectures in traction engineering for the students of the North Dakota Agricultural College, the authorities who were most interested in the work requested that the students be given a lecture on the power of steam, and impressed as strongly as possible with the amount of energy stored within the walls of a steam boiler. The aim being to impress the students so strongly with the magnitude of the force the steam engineer has to deal with, that they would never lose a wholesome respect for a steam engine. This lecture has served its purpose so well that it is offered here without further comment. The boiler generates the power for the engine and is therefore the most important feature of a traction engine. It is the part that gives the most trouble, the part that wears out first, and the most dangerous part. When properly handled and cared for it is perfectly safe, but the fact must never be lost sight of that it may, if neglected, be one of the most terribly destructive agents that man has to deal with. Comparatively few people who handle steam engines, and especially farm engines, have a clear idea of the power stored within the walls of an ordinary traction engine boiler. It seems advisable, therefore, in the very beginning to present this side of the subject with the hope that it will induce everyone who reads this article to give more care and attention to the boiler than it generally receives. The enormous amount of energy in steam and heated water under pressure is hard to comprehend. Even after seeing the figures. they are so large that the mind scarcely grasps their meaning. In order, therefore, to present the matter as clearly as possible we will take for example a well known traction engine equipped with a direct flue boiler. The specifications laid down in the builder’s catalogue are as follows: Size of engine, ten by thirteen inches; diameter of boiler shell, thirty-four inches; length of boiler, ninety inches; length of fire box, fifty-two inches; height, twenty-eight and one-half inches; width, twenty-nine inches. Number of flues, ninety; diameter of flues, two and one-half inches. Total weight of engine without water, 22,830 pounds. Weight of water with two inches showing in the glass, 3,250 pounds. As traction engines are commonly rated this would be properly a 25-horsepower engine. The number of cubic feet of water in the boiler was found to be fifty-two, and the steam space about twenty-six cubic feet as nearly as could be estimated. This gives a ratio of two cubic feet of water space to one of steam, which is about right for boilers of this class. The steam pressure was taken at 150 pounds gauge pressure and the computations made accordingly. The weight of a cubic foot of steam at 150 pounds pressure is shown by the steam tables to be 0.374478 of a pound, which multiplied by 26, the number of cubic feet of steam in the boiler, gives 9.73 pounds of water in the form of steam. Each pound weight of steam at 150 pounds (per square inch) gauge pressure contains 134,521.2 foot pounds of energy which may be set free by explosion, as will be seen on referring to the accompanying table. This number multiplied by 9.73 gives a product of 1,308,887.3, which represents the total number of foot pounds of energy stored in the steam alone. Since water in a boiler at 150 pounds (per square inch) pressure has a corresponding temperature of 365.7 degrees Fahrenheit, it also contains a great amount of energy which may be set free by explosion. Pound for pound there is not as much energy in the water as there is in the steam, but there are so many more pounds of the former than of the latter that the total amount of energy in the water greatly exceeds that in the steam. Cold water is not explosive at any pressure because water is not compressible, and consequently it has no tendency to expand when the pressure is removed. Hot water, however, if hotter than 212 degrees Fahrenheit, has a certain amount of explosive energy depending upon the pressure and corresponding temperature, because the heat that it contains above 212 degrees will, in the case of an explosion, turn a large amount of the water into steam, which of course has a tendency to expand. The amount of energy in one pound of water at 150 pounds pressure which might be set free by explosion is shown in column 3 of the accompanying table to be 11,823.4 foot pounds. In 3,240 pounds of water (the small decimal was dropped to avoid fractions) there are 11,823.4 times 3,240 or 38,307,816 foot pounds of energy in the water, which added to the energy in the steam makes a total of 39,616,703.3 foot pounds of energy stored within the walls of a boiler and which would be set free to do destructive work in case of an explosion. If this energy could all be applied as the powder is in a rifle to shoot a ball weighing one pound vertically into the air, it would be sufficient to hurl such a missile the almost incredible distance of 39,616,703 feet, or almost 7,500 miles. A ball traveling with velocity enough to go so far would undoubtedly pass beyond the earth’s attractive force and would forever afterward circle through space as a meteor. In order to get a still clearer idea of what such a tremendous amount of energy means, we will see what would happen if, instead of applying the power to a ball weighing only a pound, we applied it in the same way to the whole engine weighing, as before stated, 22,830 pounds. A little calculation shows that it would leave the earth with a velocity of 384.2 feet per second and rise to a height of 1,735 feet, almost one-third of a mile. At such a height it would appear a mere speck in the sky, sailing high above most of the clouds. Or if this total amount of energy were applied to a cannon ball weighing one ton, it would shoot upward with a velocity of 1,101 feet per second and finally reach an elevation of over three and one-half miles. The above illustrations point out more clearly than mere figures the tremendous amount of energy the traction engineer has at his command. They also, it is hoped, emphasize the necessity for keeping this force under control. Some men through ignorance, and others through long experience, acquire a certain contempt for the power of steam. They do not hesitate to run any sort of an engine or to carry any pressure that suits their fancy. The gauge may be wrong or the pop valve may be wrong or the water be low, but these men have no fear because they do not realize the risk they are taking. Such men and those that work with them are in constant danger, for steam is no respecter of persons. It is a good servant or a merciless destroyer, depending upon how it is handled. The writer once heard a fellow say concerning an old condemned Ames boiler, “I am not afraid to run that engine; I’d just as soon run that machine as any in the country.” That fellow was not brave, he was just a plain fool, and he did not know when he made that remark that he was advertising the fact that he was not an engineer. A good engineer would not say such a thing; he understands the danger too well and will not take unnecessary chances; on the contrary, he takes every precaution to make both life and property safe. He should have plenty of nerve and cool head in case danger does arise or he will be a poor man to put in charge of machinery. A man never becomes a good traction engineer until he gets over a certain nervousness that all beginners experience when they first begin to work with an engine, but when that time of self confidence arrives he should guard against feeling too sure and becoming careless and reckless. While the lesson just presented may seem to be calculated to inspire fear of an engine, the fact is that no such result is anticipated. There is a difference between fear and proper respect. This lesson is intended merely to inspire respect for an almost limitless force, with the hope, as before stated, that it will induce those engineers who read to be more careful. Taking up the subject of boilers in a general way without especial reference to the traction engine, we find that they may be classified in several ways. To begin with, they may be divided into two main classes, one comprising those, which are internally fired, and the other those that are externally fired. Internally fired boilers are provided with a fire box or furnace within its own walls. All locomotive boilers, traction engine boilers, marine boilers, and many boilers used in stationary engines belong in this class. Externally fired boilers are placed over a furnace built especially for them and are set in a brick setting. They are therefore not designed for portable purposes, and find their widest application for mill and factory work and for central heating plants. These two classes may be again divided into two more classes depending upon the course taken by the hot gases, one being composed of shell or tubular boilers, known as fire tube boilers, and the other as water tube boilers. In the fire tube boiler the hot gases pass through the inside of the tubes or flues on their way to the chimney, and water circulates about the outside. In the water tube boiler these conditions are reversed, water occupies the space inside the tubes and the hot gases pass on the outside. Both types of boiler have certain advantages peculiar to themselves. The water tube boiler is a quicker steamer than the fire tube because there is no large mass of water in one body to be acted upon by the hot gases, since it is very effectually broken up by the large number of water tubes. Boilers of this class are also less liable to a dangerous explosion, for if an explosion does occur at all, only one or two tubes are likely to let go, in which case no great damage either to life or property is apt to take place. On the other hand, these boilers are much more expensive than fire tube boilers and are much harder to keep in good working order. Many manufacturing plants and some steam ships are equipped with boilers of this class, but all locomotive boilers, and all traction engine boilers, with but one exception, are of the fire tube class. Boilers may also be classified according to form as either horizontal or vertical. Vertical boilers are not as efficient as horizontal ones and are not generally used except where there is plenty of overhead room and floor space is very valuable. In stationary practice there are a great many different conditions to meet and a great variety of work to be performed, thus giving rise to a large number of different types of boilers, but in traction engineering the case is different. The work a traction engine has to perform is practically the same everywhere, whether it is used in threshing, plowing or freighting; consequently there are not so many types of boiler in use as in stationary practice. At the present time nearly all traction engine boilers may be divided into two classes, the fire box direct flue boiler and the return flue, with the direct flue considerably in the lead as to the number in active use. Both types of boiler have been used for a great many years and both have given satisfaction to their users. Since both have their strong points and both have defects, a discussion of which will be given later, it seems well to call the reader’s attention to the fact right here that it is impossible to construct a boiler or any other piece of machinery that is entirely perfect. The best the designer of machinery can do is to compromise what, in his judgment, are the least vital points, and consciously or unconsciously this is just what he does do in every case. When the wheat-raising prairie states were being developed, it became necessary to invent a boiler that would burn straw, on account of the high price of wood and coal and the difficulty of getting it at any price. One of the first really successful straw burners was the Michner return flue boiler shown in Figure 1. The boiler was a good steamer and was built of good material, but it violated two of the first principles of correct boiler design. One portion of the boiler, the V-shaped space between the main flue and the shell, was difficult to clean thoroughly, and the lower sheet in the main flue was not protected by water on the side opposite the fire. As a result of these two defects, these boilers, after a few years’ use, became burned and weakened at these two points, and became exceedingly dangerous. A great many of them blew up, killing members of the crew and damaging property. Since then very great care has been exercised generally in building traction engine boilers, with the gratifying result that they are now as safe as any other class of boiler on the market. Figure 2 represents the leading features of the return-flue boiler. Different companies modify the details of construction to some extent, but the principal features remain the same. For example, some manufacturers provide the combustion chamber with an annular water-ring connected with the main water space of the boiler, while others merely put in a fire brick lining to protect the metal in the walls of the combustion chamber. This type of boiler is a modification of the Scotch boiler so long used and so favorably known in stationary practice. 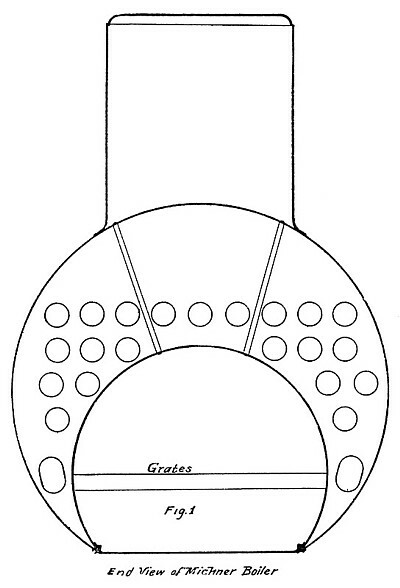 Figure 2 shows the boiler used as a coal burner, and Figure 3 shows the arrangement of the fire box and grates when burning straw. In straw burners the grates are placed slightly above the center of the main flue. Among the good features of this type of boiler may be mentioned its absence of flat plates and of stay bolts, its cheapness of construction, and the comparative ease with which it may be cleaned. Having no low hanging fire box it is raised above the ordinary obstructions in the road, which is of considerable advantage in rough, stony ground, a feature which has caused this type of boiler to be used largely for freighting in mountainous districts. To offset these advantages it has a relatively small fire box and a small ash-pan, which necessitates considerable care on the part of the fireman to prevent the ashes from filling under the grates and thus burning them out. By making the main flue larger these defects might in a measure be overcome, but this on the other hand introduces an element of weakness, since it is a well-known fact that a tube is less liable to withstand external pressure than internal, and its strength rapidly diminishes as its diameter increases. Consequently in all traction boilers built east of the Rocky Mountains the size of the main flue is made as small as possible, ranging only from 24 to 28 inches in diameter. On the Pacific Coast, however, some boilers are built with main flues upwards of four feet in diameter which are reinforced by being corrugated, as shown in Figure 4. This adds considerable strength to the flues, but at the same time makes a convenient place for the accumulation of sediment and scale. The main shell in these boilers is large in diameter for the amount of power developed, and this, added to the fact of a smoke stack in the rear end is considered a valid objection by some good engineers. Figure 5 represents a direct flue, locomotive fire box boiler adapted for burning straw. All principal parts are lettered and their names appear in the following key. A represents the shell; B, the dome; C, the flues; D, the fire-box; E, the grates; F, the dead-plate; G, the ash-pit; H, the crown-sheet; I, the flue-sheets; J, the smoke-box; K, the chimney; L, the smokebox door; M, the water-leg; N, the draft doors; O, the straw chute; P, the fire brick arch; Q, the handholes; R, fingers for guiding the straw; S, a through stay; T, the fusible plug; U, the stay-bolts; V, the waist seam; W, reinforcing rings about openings; X, the filling plugs; Y, are diagonal stays; Z, small door on side of boiler for cleaning the end of the flues; AQ, cleaning plug; AN, the exhaust nozzle; OD, door in straw chute. The particular advantages claimed for this type of boiler are: the small diameter of the main shell, a feature which adds strength, for it can easily be proven that with the same thickness of metal a tube becomes stronger as its diameter becomes less; its neat appearance, its large fire box, large ash-pan, and large grate area, which make it an easy boiler to steam and one that is easy to crowd in case of emergency, and lastly, the convenient arrangement of valves and levers made possible by having the smoke stack on the front end. In connection with these advantages there are of course some inherent defects, among which may be mentioned the flat plates of the rectangular fire box and the large number of stay-bolts necessary to hold it in shape, both of which will presently be shown are in some respects elements of weakness; added to this is the difficulty of cleaning, the liability of burning the crown sheet and the danger of the low-hanging fire box dragging in the mud in going over soft ground or catching obstructions in the road. The tendency of pressure within a boiler is to make all flat plates assume a spherical or semi-spherical form, thus placing them under two kinds of strain, viz., bending and tension. It is, therefore, necessary to put in stay-bolts or braces to support all the flat plates, such as the walls of the fire box, the top of the dome, and that part of the flue-sheets above the flues. The flues act as tie-rods for the space they occupy. The number of stay-bolts and their size depends upon the thickness of the boiler plate and the steam pressure carried. Rules have been laid down covering these points and all boiler makers are governed accordingly. In traction engines each stay-bolt supports approximately twenty square inches of surface. The objections to this form of construction lie in, first, the difficulty of cleaning occasioned by a large number of stay-bolts; second, the added strain placed upon stay-bolts and upon the unsupported part of the plate in case one breaks; and third, the possibility of corrosion at the point where the stay-bolt penetrates the plate. While these objections hold good to a greater or less extent, the fact must not be lost sight of that these boilers have stood the test in the field and have honestly earned their popularity. 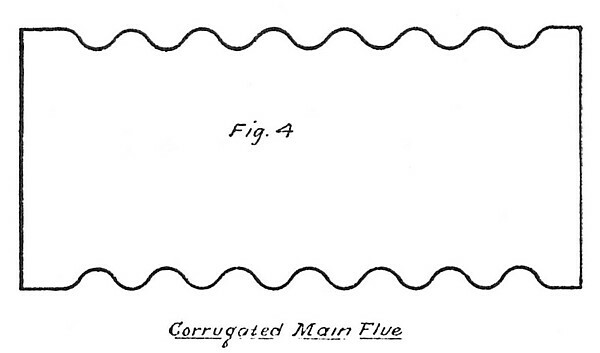 In Figure 5 the flue sheets are braced by what is called a through stay, that is, a rod passing through both flue sheets and riveted at each end. There are, however, two other methods of bracing in common use. One is by means of diagonal stays from the flue sheet to the upper part of the boiler shell similar to those shown in the dome in the illustration. The other is by means of a girder stay riveted across the flue sheet and illustrated in Figure 6. When the girder stay is used it is usually placed above the flues in the front end, and diagonal stays are used in the rear. All of these methods of staying are effective and appear to have about equal merit. In addition to the two types of boiler above discussed, two other types may also be mentioned: the fire box return flue boiler, and the water tube boiler previously alluded to. The former differs from the ordinary return flue boiler in having a fire box or furnace like the direct flue boiler, but in all other essential respects it is like the return flue boiler above described. A large number of these boilers are still in use, but, so far as the writer is aware, they are not now built by any of the traction engine builders, having been supplanted in very recent years by the direct flue type. The only water tube boiler built for traction engine purposes is made by the Westinghouse Company of Schenectady, New York. This boiler consists of a vertical shell surrounding a central portion which contains the furnace and water tubes. The latter are placed horizontally in courses at right angles to each other and circulation is provided for by means of baffle plates at the ends of, and between the sections, which causes the water to pass from one set of tubes to another. The hot gases pass through the central part of the boiler through the space occupied by the water tubes. The outer shell is bolted to the lower portion and encloses the main water space, and the steam space at the top. This boiler is a quick steamer and quite efficient, but for traction engine work it is manifestly not very well adapted to the large sized rigs used in the West.